On April 23, something unexpected happened to me. I woke up that morning to fly to Boston for a screening and panel discussion about my new documentary, Stranger Fruit, at Harvard’s prestigious Institute of Politics. The panel—with the film’s director, Jason Pollock, and my attorney, Benjamin Crump—was very moving. At one point during the panel, Benjamin leaned over to me and said, “Hey Lezley, tell ’em what you’ve been thinking about.” He smiled and laughed at me because he knew he had caught me off guard, but I was excited for this moment and took it. I told the audience that I was contemplating a run for City Council in Ferguson, Mo. The eruption of applause that followed truly blew me away. I’ve been on a lot of panels over the past four years, and I had never heard a room explode like that. The applause went on for some time, and I knew in that moment that something very, very special had just taken place. By the time I got off the stage at Harvard that night, my phone was exploding with messages. The news of my announcement had already hit social media, and the press had started writing articles about it. When I woke up the next morning, that simple sentence I had said at Harvard had become worldwide news. The whole experience still takes my breath away. Since last week, I have received countless messages of support and many questions about my intent and why I think this might be a good idea. I thought it would be best to address all of that publicly now so that we are all on the same page about this. My life changed forever in 2014 when a Ferguson police officer killed my son. The Ferguson Police Department then went on an elaborate mission to not only defame Michael but also defame me and my entire family. Still, to this day my family has dealt with the repercussions of their defamation against me and my son. The city of Ferguson offered no support to me whatsoever, and I watched how my government moved quickly to defend a single police officer’s career over my son’s life. Since that terrible experience, I have gone through so much pain and anguish caused by Ferguson that it’s impossible to write about it in this short note. However, I have turned my pain into a passion to change the system that could so easily kill another child in the street and then cover it all up. Great reforms need to come to Ferguson, and I don’t want my children to grow up in a city where what happened to Michael can happen to anyone else. We need to rebuild the entire system from the inside out. The only way that can be done is by having people, like me, who have been harmed by the system working inside it to make the right change that is needed. To be clear, I have not made an official announcement, and I’m not sure when I will be running. I’m working with my team now to launch an exploratory committee, and we will be having meetings around the city to discuss these issues. The worldwide support we are already getting is truly unbelievable and shows me that my heart is in the right place with this one. Everyone in the whole world knows that the Ferguson government is incredibly broken, and it’s going to take strong mothers like me to fix it. Mental health support is going to be a big part of my campaign as well. If you are a family like mine who has been victimized by police brutality, I’ll be pushing for us to have state-assisted, mental health therapy after police shoot and kill unarmed victims. In addition, our campaign will be pushing that police should obtain housing in the area they police! This seems like an obvious statement, but as we all know, it is far from reality. We always have white cops in our community who drive here sometimes from farm country an hour away. How are they supposed to be able to interact with us when they come here from a different planet? By living here, cops won’t be so fearful of our streets. Police need to be establishing relationships with the community and not just with the corner-store owners so that they get free Diet Cokes. Another program I would like to see continued at the Ferguson City Council is something I’ve been building through the Michael O.D. Brown Foundation. We partnered with PALS, a St. Louis County police organization designed to get grade school kids involved in extracurricular activities. Through this partnership, we started a growing and learning garden in support of fighting childhood obesity and hypertension. Our garden also serves as a way for us to educate our youths on the importance of a healthy diet and to give fresh, locally grown vegetables back to the community. We planted seeds together and we will reap what we sow together. We want to show community unity through raising this garden together because it has real life inside it. This collaboration also includes Jennings School District. We at the Michael O.D. Brown Foundation can’t wait to partner with other school districts and police departments in different municipalities to do the same work. Learning is growing and growing is learning. We are choosing to do it TOGETHER!!! I will lay the first piece of wood to build this bridge of trust between the community and Ferguson police, because a community should feel comfortable in their homes at all times of the day. Let’s never forget, my son lost his life, execution style, at noon in broad daylight. This heinous event took place in 45 seconds, and no day has been the same in the small city of Ferguson since. St. Louis is the Show Me State? Well, guess what ... TIME’S UP. 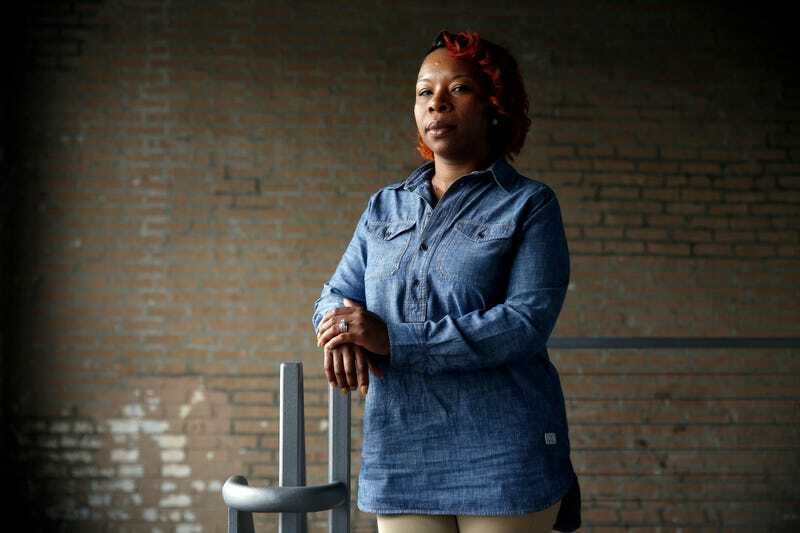 Lezley McSpadden is the mother of Michael Brown. She is the author of Tell the Truth, Shame the Devil and the CEO and founder of the Michael O.D. Brown Foundation. Follow her on Instagram.